Apple announced on Wednesday that it will reveal results for the first fiscal quarter of 2013 on Jan. 23, which will be followed by an earnings conference call expected to cover initial statistics for the holiday season as well as performance numbers for the iPad mini. The announcement was posted to Apple's Investor Relations webpage and noted the conference call will start on Wednesday, Jan. 23 at 2:00 p.m. Pacific/5:00 p.m. Eastern. A live audio stream of the call will be available here. In the fourth quarter of 2012, Apple saw a 25 percent boost in profits thanks to strong sales of 44 million iDevices, including 26.9 million iPhones, for the three month period. Revenue for fiscal 2012 reached over $156 billion on sales of more than 200 million iOS devices, 18 million Macs, and 35 million iPods. For the upcoming report, Apple forecast revenue of $52 billion and diluted earnings per share of about $11.75 for the quarter ending in December. The multitude of new product launches and product line refreshes, like the iPad mini, iPhone 5 and newly redesigned iMac line, are expected to drive down gross margins that could equate to a decline of 400 basis points for the three month period. 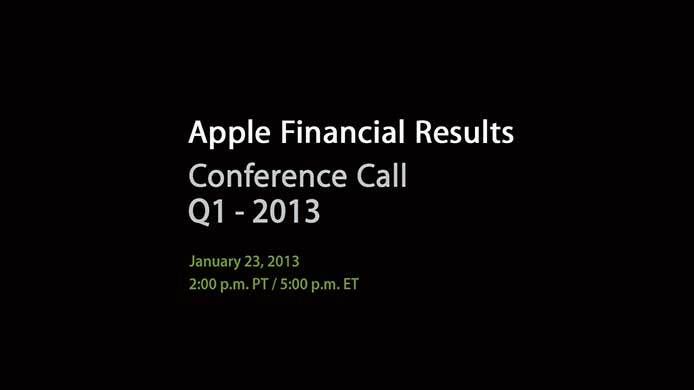 As always, AppleInsider will be offering live coverage of the earnings report and ensuing conference call on Jan. 23.